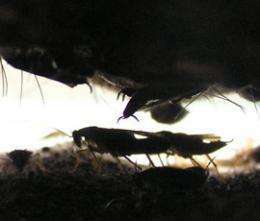 (PhysOrg.com) -- Ever wondered how cockroaches seem to know the best place to grab a meal? New research at Queen Mary, University of London suggests that, just like humans, they share their local knowledge of the best food sources and follow 'recommendations' from others. It is often striking how little we know about our closest neighbour. Until now, it was assumed that cockroaches forage on their own to find food and water. However, this work shows how groups of the insects seem to make a collective choice about the best food source, explaining why we so commonly find them feeding en masse in the kitchen late at night. Dr Mathieu Lihoreau from Queen Mary's School of Biological and Chemical Sciences, explained the potential impact of his research, saying: "Cockroaches cost the UK economy millions of pounds in wasted food and perishable products. Better understanding of how they seek out our food would allow us to develop better pest control measures, which are frequently ineffective and involve the use of insecticides that can have health side-effects." This study, published in the Springer journal Behavioural Ecology and Sociobiology, is the first demonstration that groups of cockroaches can forage for food collectively, rather than independently, relying on their individual experience. In the experiment, hungry cockroaches (Blattella germanica) were released into an arena where they could choose between one of two piles of food. Lihoreau noted that, rather than choosing one randomly and splitting into two groups as would be expected if they were acting independently, the majority of the cockroaches fed solely on one piece of food until it was all gone. By following individual insects, it also emerged that the more of cockroaches there were on one piece of food, the longer each one would stay to feed. Through simple snowball effect then, most of the cockroaches accumulate on one source. Once identified, a man-made 'foraging pheromone' could be used to improve pest control, making insecticide gels more effective or be used to create an insecticide-free trap. Lihoreau explains; "These observations coupled with simulations of a mathematical model indicate that cockroaches communicate through close contact when they are already on the food source. This is in contrast with the honeybees' waggle dance or ants' chemical trails, which are sophisticated messages that guide followers over a long distance. Although we think they signal to other cockroaches using a 'foraging pheromone', we haven't yet identified it; potential candidates include chemicals in cockroach saliva, and cuticular hydrocarbons, which cover the insects' bodies." This work doesn't only provide the first evidence that these insects search for food collectively, but it also gives a simple explanation for it that could potentially apply to a wide array of animals, including humans. "We should definitively pay more attention to cockroaches and other simple 'societies' as they provide researchers with a good models for co-operation and emergent properties of social life, that we could extrapolate to more sophisticated societies, like ours," says Lihoreau.